Alrighty, folks! Got another d30 chart for you this week. 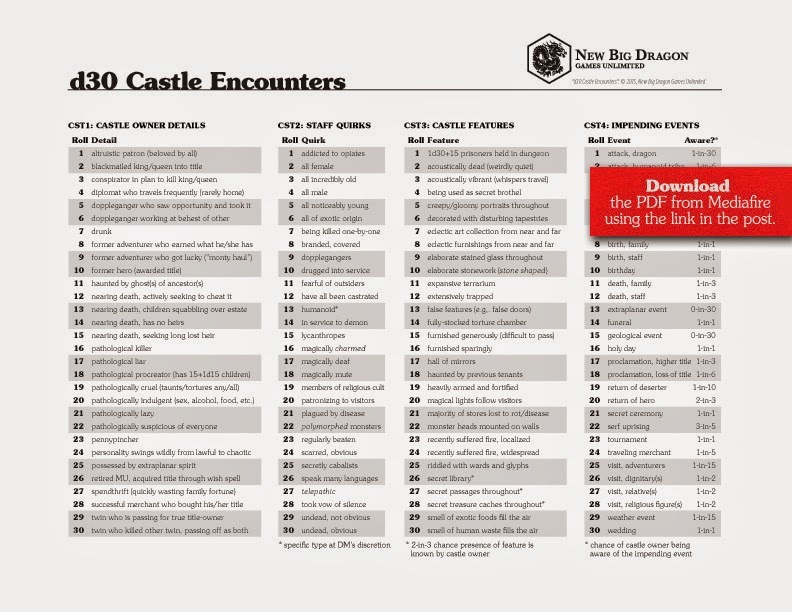 Today's PDF download is a d30 Castle Encounters page. This is meant to compliment the Castle Generator tables found on pages 26-27 of the d30 Sandbox Companion. The first table features background information on the castle owner (sample results include: conspirator in plan to kill king/queen, nearing death, has no heirs, and successful merchant who bought his/her title). The second table features quirks about the staff (sample results include: addicted to opiates, fearful of outsiders, and telepathic). The third table features castle features (sample results include: being used as secret brothel, extensively trapped, and haunted by previous tenants). Finally, the fourth table features impending events, and notes the chance of the castle owner being aware of the impending event (sample results include: attack from a monster, birth in the family, and visit from a religious figure). Click here to download a free PDF of d30 Castle Encounters page from MediaFire. Just like my d30 posts, my "New Monster Mondays" have also been lagging. But then again, I did finally release the Creature Compendium, so I think that should count for something. Okay, that being said, this is the first of many new creatures I have already created, have set in the pipeline, and am stockpiling with my eye on the (not-sure-how-far-in-the-) future release of Creature Compendium II. Based on what I've been working on so far, I'm thinking it will have a slightly higher count of psionic and extra-planar creatures than the current Creature Compendium, though I'm trying to keep it from going too heavy that way (e.g., by comparison, I have a couple of interesting plant monster ideas, and a couple of new sphinxes). When spellcasters are attempting to create scrolls that call on the powers of the lower planes, there is a 5% chance per level of the spell that the attempt to create the scroll will be interrupted by the appearance of an inkling—an evil spirit which inhabits the spellcaster’s ink, takes on a humanoid form, and grows (during a single round) to approximately 2' in height. Wherever an inkling appears, a mess is sure to follow, with the inkling sloshing and splashing, and leaving trails and drops of ink everywhere it goes. The messier an inkling makes a place, the happier it is, for mayhem is its sole goal. Only silver or magical weapons are effective against an inkling. Inklings are immune poison, and take no damage from electrical or cold attacks. However, successful cold attacks will slow them to half speed for 1d4 rounds. They take normal damage from fire and are susceptible to most other forms of magical attacks (including sleep, charm and hold). In combat an inkling can attack with its “fists”, doing 1d4 on a successful “to hit” roll. More effective for an inkling, however, is to spit ink an opponent up to 30' away, blinding the opponent on a successful “to hit” roll (no saving throw). This blindness will remain until the victim’s eyes have been thoroughly washed (takes approximately 1 turn to do so). 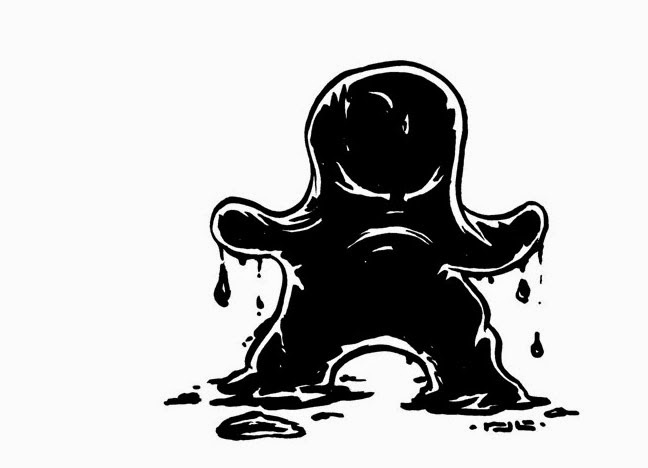 Use of dispel evil will send the evil spirit away, leaving behind a tiny puddle of ink (plus whatever mess the inkling made). An inkling may be summoned through the use of the 2nd level magic-user spell summon inkling. To be successful, the spell requires a small pot of black ink (at least 4 ounces). There is only a 5% chance that a summoned inkling will follow the commands of its summoner. An inkling summoned in this manner will only remain for 3d4 rounds before returning to its plane of origin, causing as much pandemonium as possible before it does. Holee krap! It's hard to believe it's been nearly 9 months since my last post of a d30 chart. Is it any coincidence that was right before I took over Petty Gods? I think not. I've got a whole big ol' list of d30 chart ideas, and time is finally freeing up a bit (though work has been getting crazier), so I'm hoping to get back to my regular Friday posting of d30 downloads. Today, I present the d30 Chimera Generator. 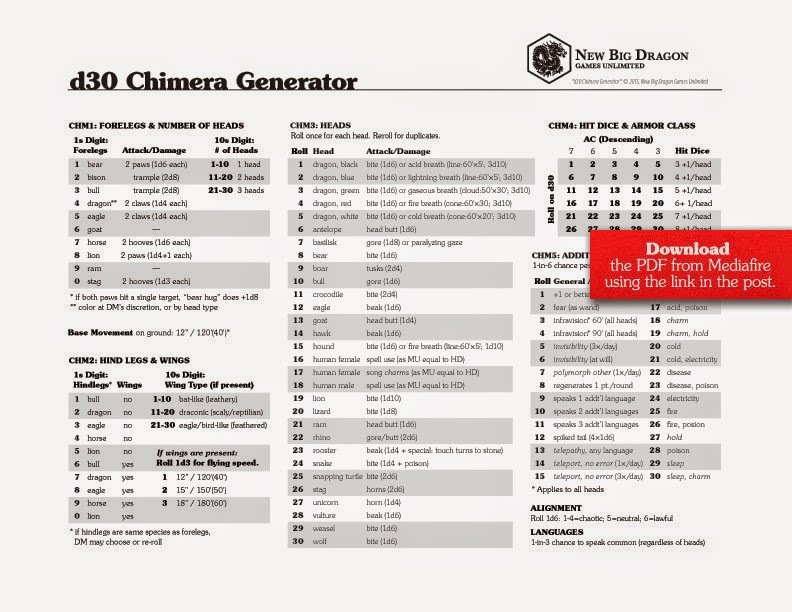 Click here to download a free PDF of d30 Chimera Generator page from MediaFire. Some thoughts towards character class and party mix. Now that the Creature Compendium and Expanded Petty Gods are out, I've been turning my attention back to the Basic Psionics Handbook. The things I've been been giving particular concern as of late are: 1) how the mystic and monk classes (as I've envisioned them) fit into the party mix, 2) which (possibly new) character classes compliment them, and 3) what is the setting like that supports the concpt (particularly of a mystic that comes from the Indian/Hindu template, and a monk of the Chinese Shao Lin tradition). There's always the possiblity the mystic comes across as a magic-user with his hair in a bun; so in the possible absence of traditional magic-users and clerics (since the mystics abilities seem to cover both grounds), what does a well-rounded party mix look like without feeling stale (as classes) and seeming appropriate to accompany the mystic. The Wenwet. This is a priest that comes out of the Egyptian tradition, combining elements of astrologer and necromancer, with a pinch of traditional cleric. Acrobat. This is more of a pure acrobat, without the dexterous skills possessed by thieves. They have abilities like: moving silently, hiding in shadows, climbing, tumbling, and stealth; and (maybe) at higher levels, abilities like contortion. I also see them having AC bonuses in combat (from evasive maneuvers). Savant. This is sort of an alchemist/sage/scribe/medic. With abilities like potion-making, forgery, and the fantasy equivalents of paramedicine (and surgery?). These thoughts are all I really have right now. So I'll leave it like this, knowing I'd like to start a campaign with this kind of class mix and see how it plays out. Huh?... Oh... you've heard of it? What's that?... "Quit my jabbering and just give you the damn links already?" I will, but I need to do something first. I need to thank all of the folks who contributed to this beast. This project could not have existed if not for the generous contributions from the hundreds (yes, hundreds!) of people who helped make this book possible. Now, without further ado, I present Petty Gods: Revised & Expanded Edition! Many of you have seen and commented on the "ORC" (Old-school Role-playing Community) designation that I'm using on expanded & revised edition of Petty Gods, and several people have asked about getting a copy. Before I release this into the wild, I want to go over my reasons for creating the designation in the first place. As I was working on Expanded Petty Gods, I debated how to label the product. I was looking for something that identified who was really responsible for producing the book. While the book was designed to be LL:AEC compatible, this is really not a Labyrinth Lord product (which is why that logo was left off, though the LL copyrights are acknowledged inside). And while I could have used one of the several OSR logos that already exist, those logos (in my mind) say, "This is a certain kind of product," not "These are the people who produced this product." But more than that, I really wanted something that said, "This is a different kind of product. This product isn't just full of works contributed gratis by their creators and owners, this book is not about profit. This is a book about contributing back to the community as a whole." 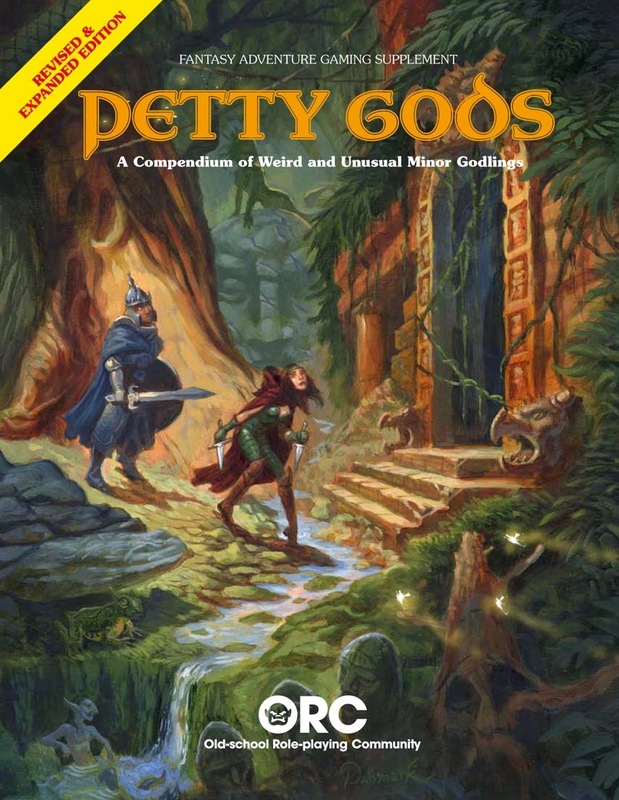 Some people find it surprising that after the work I've put into Expanded Petty Gods, the PDF will be free, and the print copies will be available at cost (with no markup on top of the printing). I think it's reasonable to ask a question like that when you look at things like the One-page Dungeon Compendium or magazines like Fight On!, the insides of which consist of (unpaid) contributed material, but as a product are sold for profit by their organizers and publishers. Please understand, I don't fault them for that; managing products like those is a feat that deserves some reward, and I'm glad they reap some benefits for the time they put in. That being said, I hope you can understand why something like the ORC designation seems needed, to separate truly community-centered non-profit projects from traditional projects where the community simply contributes. Though I've been a fan of manifestos for a while (e.g., Dogme 95 and the Manifesto of Futurism), I can't say that ever written one. And I'm not really sure what I've written below is so much a manifesto as a list of criteria of what I see as qualifying to use the ORC designation. an RPG (or related) work, ALL of the following criteria must be met. A minimum of three (3) members of the OSR community must have contributed to the project. [a] the ORC logo may appear on a page with any generic OSR name, designation, or mark (e.g., a logo bearing the name “OSR”). [b] the ORC logo may appear on an interior credit page where the names of contributors include the names of their respective companies, blogs, etc., but as typography only (page may not include visual trademarks or designations), and those company/blog credits MUST appear secondarily to the name of the contributor (aliases and pseudonyms are considered an exception). At a minimum, the product/project bearing the ORC mark must be distributed as a free-of-charge PDF. If distributed as print (in addition to the free-of-charge PDF), the print edition(s) must be sold “at cost” (that is, there may be no markup on the price beyond the costs of printing and shipping). [Exception] The ORC logo may appear on a project where proceeds from the project are donated to charity. However, all contributors must be notified of, and agree to, this condition, including the designated charity. To the best of the publishers’/editors’ abilities, ALL contributors must be acknowledged in some way, either 1) as part of the project’s Acknowledgements or Forward, 2) on a Credits page, 3) next to the name of the contributed material within the context of an Index or Table of Contents, or 4) next to an individual entry inside the book. This includes not only those works designated as Creative Commons, but those works designated as being in the public domain. The individual logos of companies and/or blogs may appear in a product or project, but may never appear on a page bearing the ORC logo or designation. When used in text (rather than as a visual mark), the ORC identifier should always appear in all caps (as “ORC”; never as “Orc” or “orc”). By using the ORC designation and visual mark, you are hereby agreeing to abide by the standards set forth above. Okay, you got me. It is sort of a manifesto. Now the next question I'm sure you're all asking is, "Where can I get a copy of the logo?" I'm not ready to distribute it just yet. (I'm still deciding on some things like acceptable color usage, plus need to put guidelines on its application like scaling is okay but squeezing/stretching isn't, etc.) However, if you have a project that you think qualifies, you can email orcdesignation(at)newbigdragon(dot)com with a brief description of the project, and I'll see about getting you what you need. Petty Gods: Revised & Expanded. 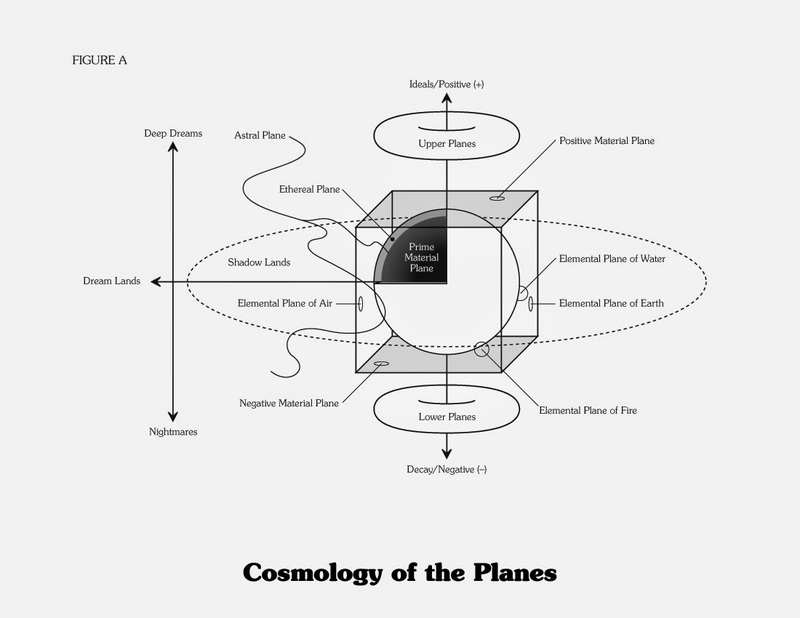 For a while now, I've been contemplating how I would depict the planar cosmology should I follow up the Basic Psionics Handbook with a Basic Guide to the Planes. Mr. Marsh has two different cosmologies he uses: one he uses for D&D games, and one he uses for non-D&D games. The one he uses for D&D relies heavily on his old concept that the various inner planes are like sheets of paper in a box. I've always been enamored of the cubic structure that came from Mr. Marsh's tetrahedral structure of the inner planes (the cubic one is the one that Gary expanded upon in Dragon #73 in his Sorceror's Scroll article for that issue, "The Inner Planes." (You may recall the full color page cutout that you could cut and assemble into the cube.) In Mr. Marsh's drawing from 2005 (the first link above), I really like the idea that the Shadow and Dream planes be part of the cosmology, and that moving "upward" (to the Upper Planes) brings you closer to ideals and positivity, and that moving "downward" (to the Lower Planes) brings you closer to decay and negativity. Based on the above, I've put together a planar cosmology that I think covers all my bases, and in a way that supports the way I think of the planes interacting. 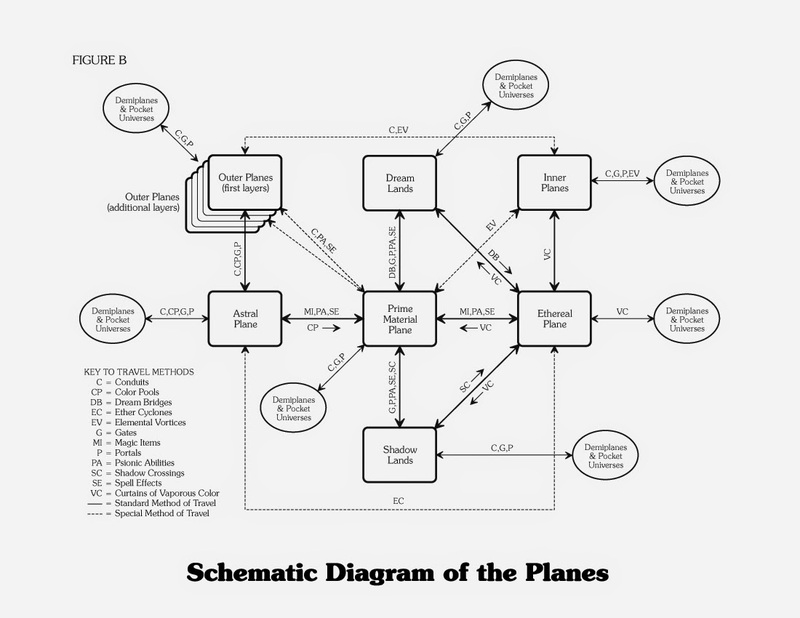 I've also put together a schematic of travel between the planes. This may morph over time, but right now, I'm feeling pretty good about them. Feeling like a slacker lately... but not. I have conflicted feelings about my lack of attention to this blog over the last few months, offering little more than the occasional Expanded Petty Gods update. And for someone who used to make 4-5 posts a week, a post every couple of weeks about the same subject really feels like slacking. But then again, I've obviously been busy. I believe I'm just days away from finally releasing Expanded Petty Gods, only 6 months after my official announcement of taking over the project (a 394-page book that six months ago was little more than a couple of folders with contributions and an Excel spreadsheet with more holes than Blackburn, Lancashire). This is really just a post to say I'm looking forward to getting back to my old blogging schedule. There are some new monsters in the pipeline, as well as a couple of new d30 tables (damn, I miss doing those). I've also got some older RPGs that I want to talk about (The Official Superhero Adventure Game and Task Force Games's Supervillains). And before I forget, I wanted to thank everyone for the reception given the Creature Compendium. It is greatly appreciated. BTW, several of the creatures inside were originally conceived as Starmasters monsters, like the emerald stinkbug, as well as the bloodbeast and thuzzendahg. So, obviously, there's plenty in the Creature Compendium for those who are looking for alien creatures to populate games using Mr. Spahn's White Star. Expanded Petty Gods: Finish Line In Sight! All art is done minus 2 spaces (in progress). 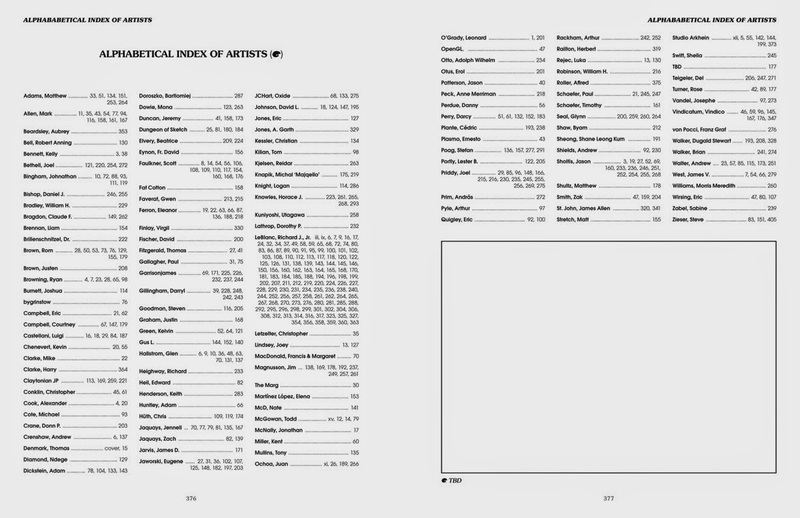 Artists Index is done (but will be updated to reflect the final 2 pieces above; obviously, one of those two is the illustration at the end of the Artists Index). The book has been proofed in its entirety once. The 2nd proof of the 1st half is almost complete, and hope to have the other half within a week or so. I am doing my absolute best to release this sometime next weekend (the weekend of the 15th), at least as a PDF, with the print books available the week after that.